If you are doing a lot of small regional trade shows in smaller venues, a Table Top Display is a perfect companion to help you draw an audience to your table. 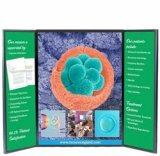 We have a large selection of Table Top Displays in multiple sizes and styles that can meet your trade show needs. If you already have the graphics, you simply provide those to use for the size display you want. Or, if you need help with your graphics, we can help you too, just give us a call.